Indications: Stimulates hormones that control ovulation. Summary Recommendations: Clomid is prescribed to stimulate ovulation. 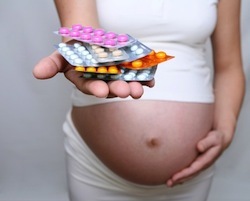 The drug should be taken as prescribed to promote pregnancy, but should never be taken after pregnancy. Brand names include Clomid and Serophene. General Precautions: Obstetricians, gynecologists and fertility specialists prescribe Clomid to men and women for the purpose of improving the change of conception. In women Clomid promotes ovulation; the release of mature eggs. In some cases, multiple eggs may mature and release after taking Clomid, increasing the likelihood of multiples pregnancy. Clomid may cause blurry vision, so women should be cautious when operating a vehicle or other machinery after taking Clomid. The medication is typically prescribed for five day cycles. Never take Clomid longer than prescribed. If you may be pregnant, have a medical condition that affects the thyroid, or have a history of endometriosis, unexplained vaginal bleeding or ovarian cysts, speak with the prescribing physician about your medical history before taking Clomid. Side effects reported when taking Clomid include flushing, breast pain, headache and abnormal vaginal bleeding. Report any and all side effects to your physician. Clomid may increase the likelihood of multiples pregnancy – a risk that should be discussed prior to starting a Clomid cycle. Effects While Trying to Conceive: Clomid is prescribed to increase chances of pregnancy, thus the drug has a positive effect on conception for some patients. Effects on Pregnancy: Clomid is in pregnancy category X, as assigned by the Food and Drug Administration. Use of the drug during pregnancy is associated with fetal complications including skeletal and genetic conditions like cleft palate and Down’s syndrome. Developmental delays, dwarfism and neural tube defects have been reported. If you are taking Clomid and find out you are pregnant, contact your physician immediately. Your Clomid cycle must be stopped immediately. Some fetal defects, like neural tube defects, can occur in the first few weeks of pregnancy. Safe During Breastfeeding: Clomid is excreted in breast milk in animals, but studies on human breast milk have not been completed. Clomid is associated with reduced lactation in humans. It is thought Clomid lowers prolactin levels thus affecting breast milk production. Women who are breastfeeding should be made aware of possible difficulty lactating when taking Clomid. Clomid may be prescribed to women postpartum if they choose not to breastfeed. One study reported a 65% reduction in prolactin levels just three days after starting Clomid.